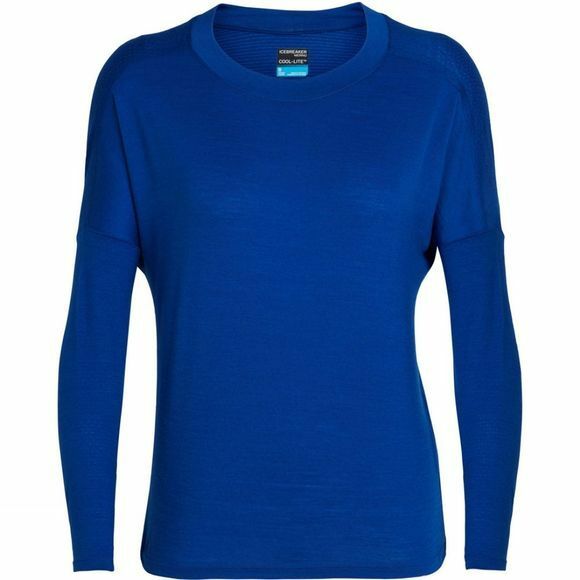 This high-performing, relaxed-fit Women's Kinetica Long Sleeve Crewe Top from Icebreaker is made to move freely with you, so you can forget about what you're wearing, and concentrate on clocking up those miles on the bike or trail. It's designed to avoid chafing, with no shoulder seam, bonded side and back seams and a low-profile merrow stitch. A smart choice for warm weather when you want extra coverage, or for intense sessions in the gym, the Kinetica Long Sleeve Crewe features Cool-Lite fabric to keep you cool, and corespun technology, where we wrap merino wool and natural TENCEL fibers around nylon for extra durability and next-to-skin softness. The eyelet mesh back and sleeves are ultra-breathable, so you can stay comfortable for longer.